This disease was observed in southern Indiana recently. 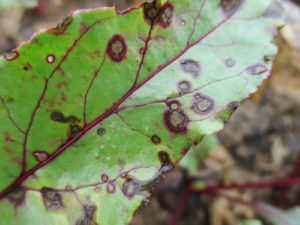 Cercospora leaf spot affects table beets and swiss chard. Symptoms include circular leaf spots that may have a reddish margin. The center of the lesions may start off a light brown and turn to gray after the fungus (Cercospora beticola) begins to sporulate. Under conditions conducive to disease, the lesions can coalesce and result in loss of foliage. Yield and quality of the crop can be reduced. Cercospora leaf spot is favored by rainy weather or overhead irrigation and temperatures from 77 to 95°F. The spores are readily dispersed in rainy, windy weather. Resistant cultivars are available. Fall tillage and crop rotations of 2 to 3 years should help to lessen disease severity. Several fungicides are listed in the 2017 Midwest Vegetable Production Guide for Commercial Growers including copper compounds, some of which may be allowed in organic certifications. Synthetic fungicides include: Products with the active ingredient chlorothalonil (e.g., Bravo®, Equus®, Initiate®); Cabrio EG®; Flint®; Fontelis 1.67 SC®; Merivon®; tebuconazole products such as Monsoon® and Onset®; Quadris® and Satori®; The Midwest Vegetable Production Guide has more information. Always consult the label before every pesticide application. Figure 1. Cercospora leaf spot of garden beet causes bray/brown lesions with reddish margins.